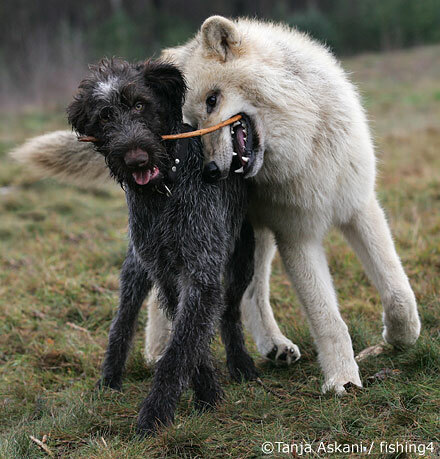 A new hybrid treatment program helps addicts and wolf dogs recover. Promises Malibu, a swanky rehab center in West LA, has teamed up with Wolf Connection, an animal rescue center, to introduce "wolf therapy" to the addiction treatment world. Recovering addicts in the program are encouraged to connect "wolfdogs" (wolves that have been bred with dogs as pets) as part of their comprehensive treatment. The therapy is designed especially to help young adults with a range of mental health issues, including drug and alcohol addiction and PTSD, and to target behavioral patterns like aggression and peer rivalry. “What we do is bring people into the world of the wolf,” says Wolf Connection founder Teo Alfero. “What that means is you cease to be a human with all of your beliefs and past experiences and get to connect with an animal that takes you to a very primal level." Integrating animals into treatment helps people to "connect in a way that is different than talk therapy," Promises program director Kelly M. Seidlitz tells The Fix. The rehab also offers activities like art therapy, rock climbing and nature trips, so the wolf therapy exercise "seemed like not an unreasonable stretch," he explains. On a typical day of wolf therapy, the participants will go on a walk or hike along with the—leashed—animals, completing various exercises designed to help them move through feelings like anger, shame and sadness. "Wolves will be able to come up with dramatic feedback with how the clients are doing," says Seidlitz. "If they are angry the wolves will avoid them."